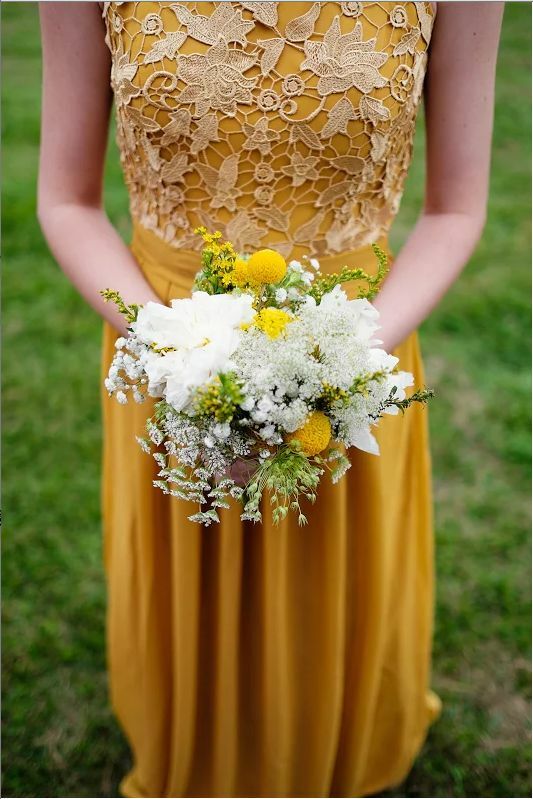 Mustard is a gorgeous yellow shade, which is rather trendy now, it’s bold and chic and often used to cheer up fall or even winter décor. 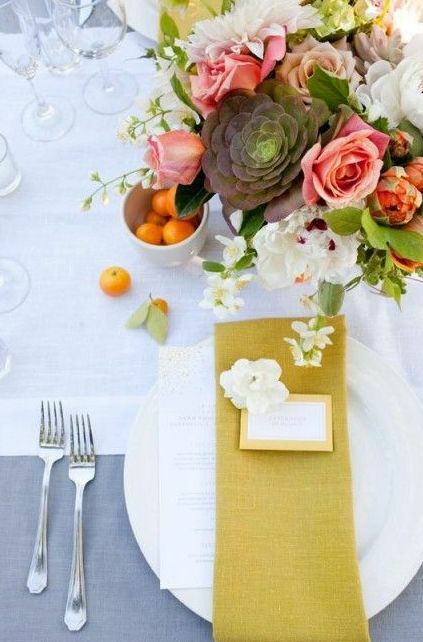 It’s not very easy to blend with other colors, so you should choose them carefully. 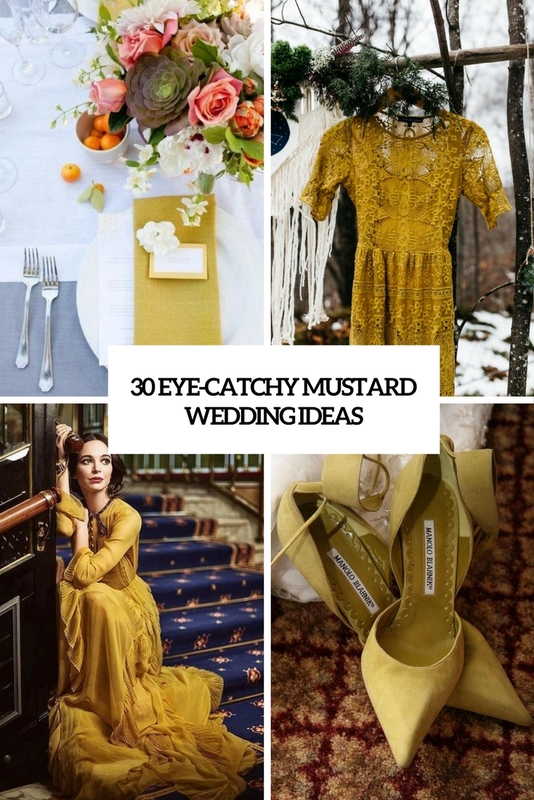 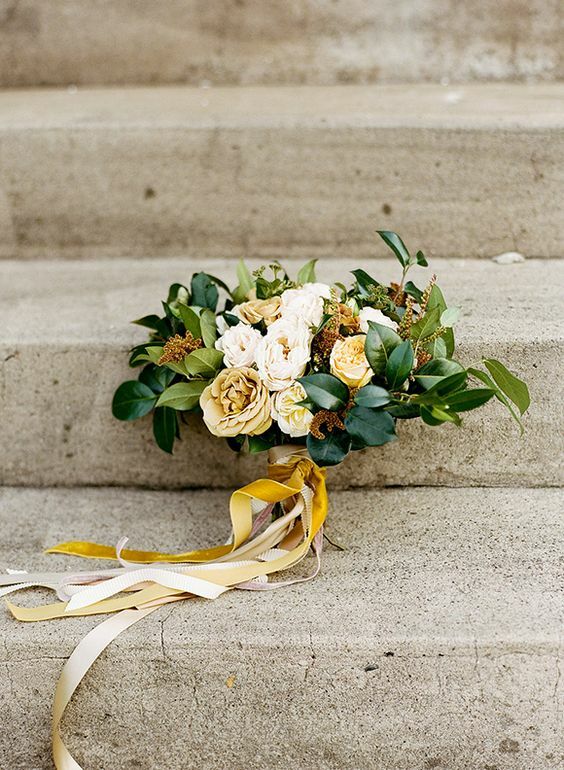 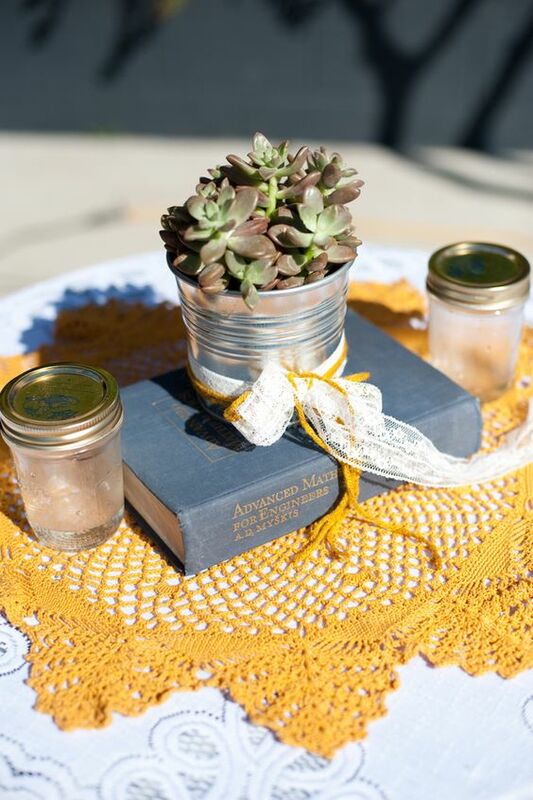 If you want to incorporate mustard into your wedding décor, here are some bold and eye-catchy ideas. 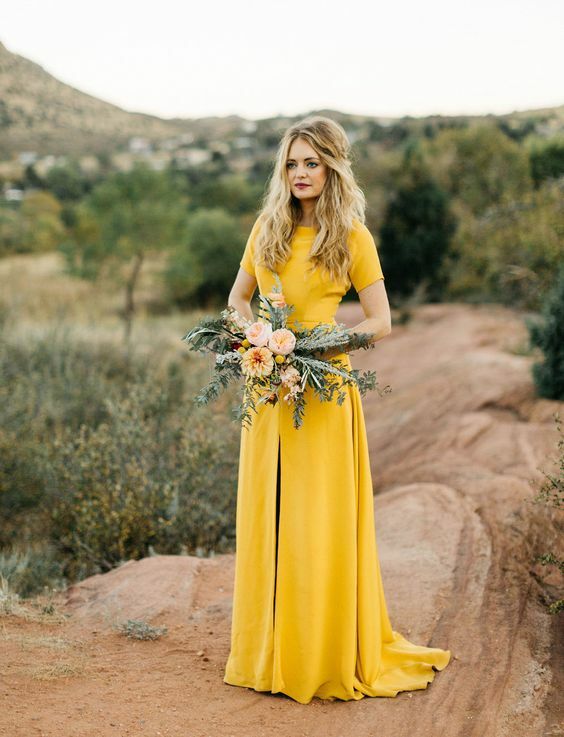 Wedding attire in mustard is getting very popular today because not many people choose it and so it helps you to stand out. 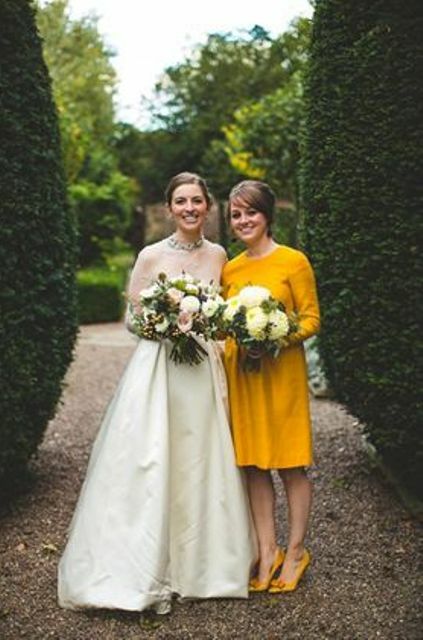 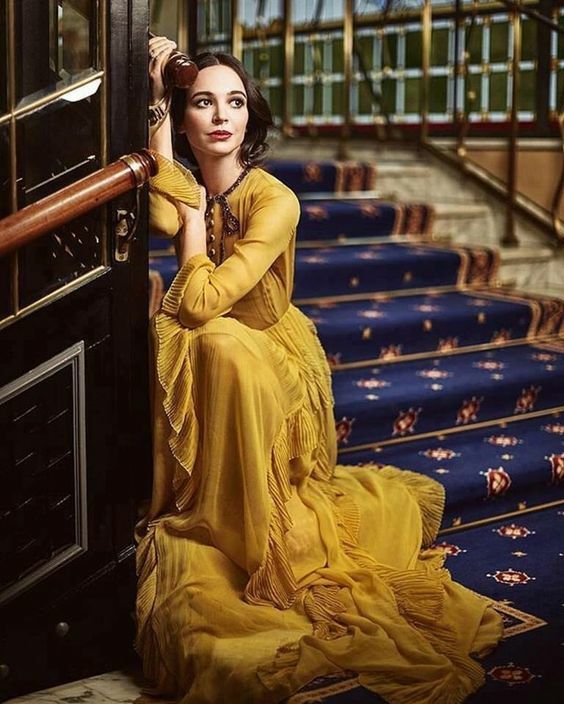 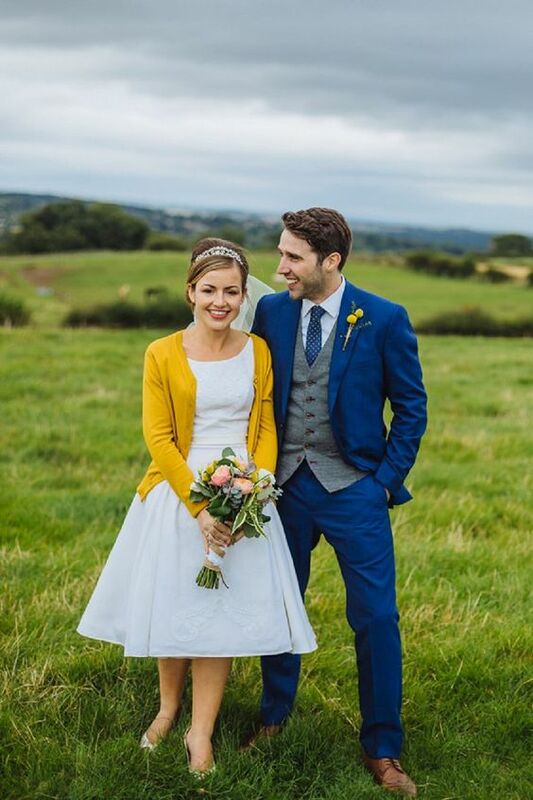 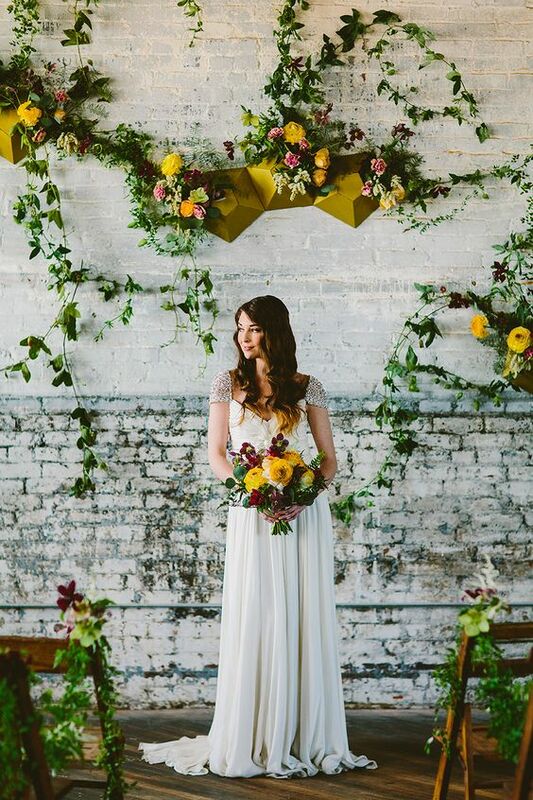 If you are a daring bride, why not rock a gorgeous mustard wedding dress? 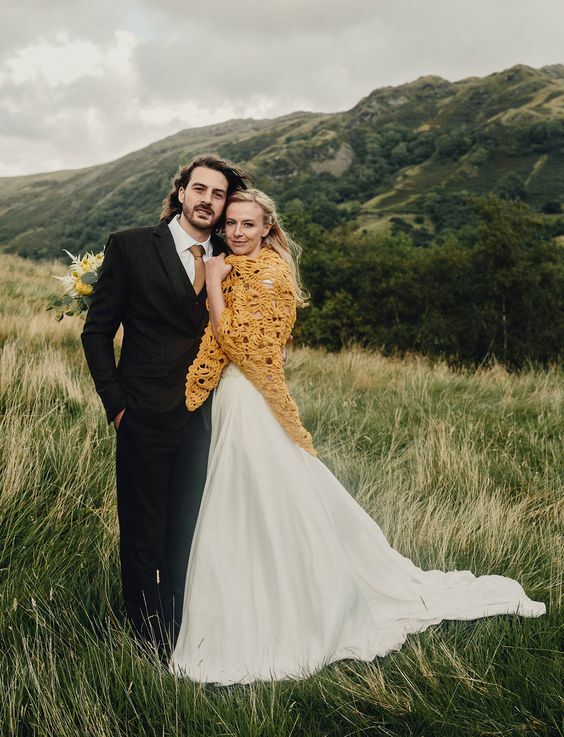 it can be a laconic modern dress with slits, a vintage-inspired pleated gown with sleeves, a boho lace mustard wedding dress for a woodland bride. 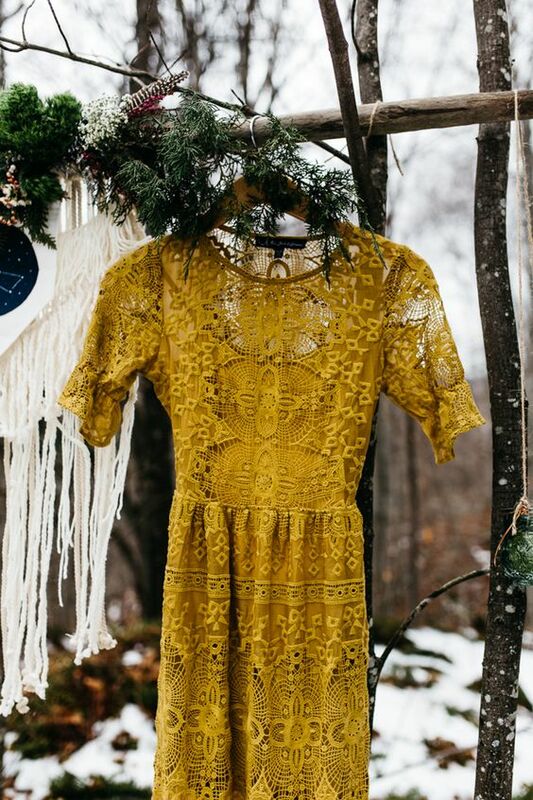 If you aren’t ready for such a bold gown, wear a mustard cardigan or a shawl that will let you embrace the season. 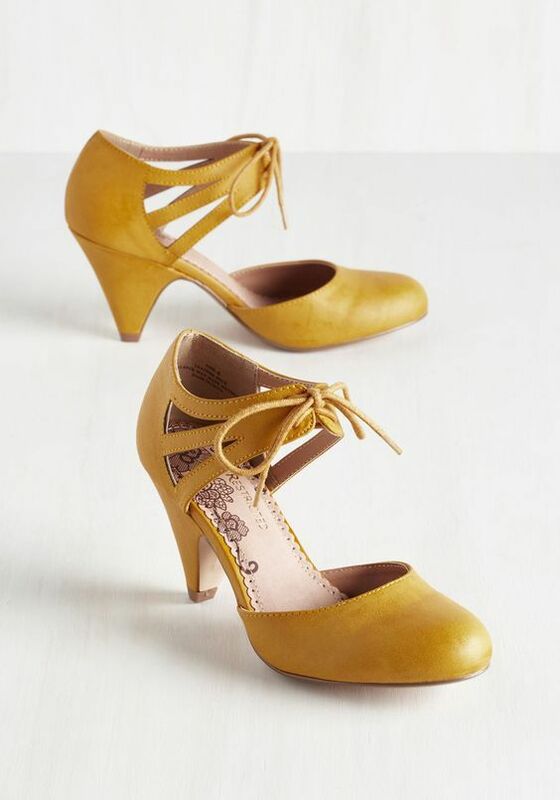 One more chic idea is a pair of cool mustard heels, find a perfect pair with detailing that fits your outfit. 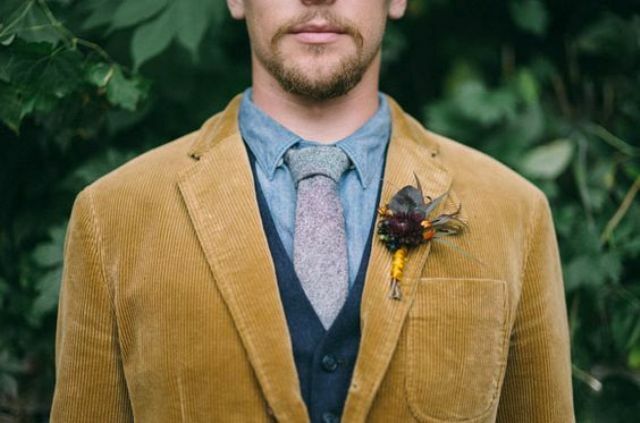 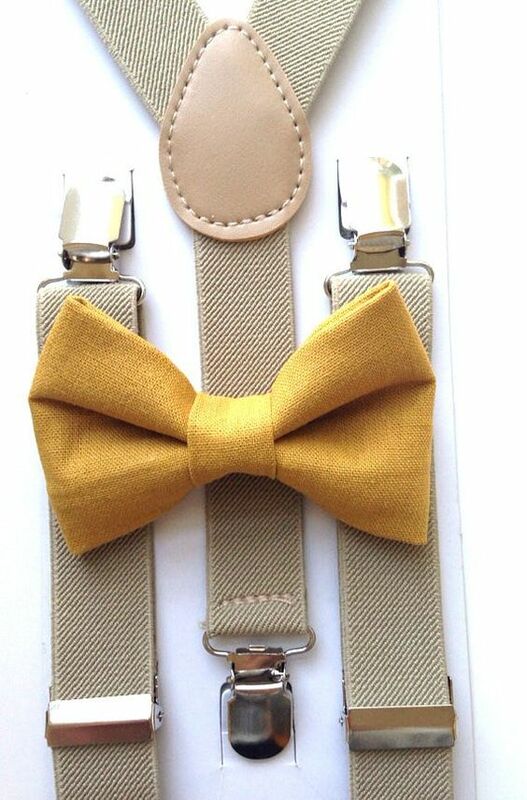 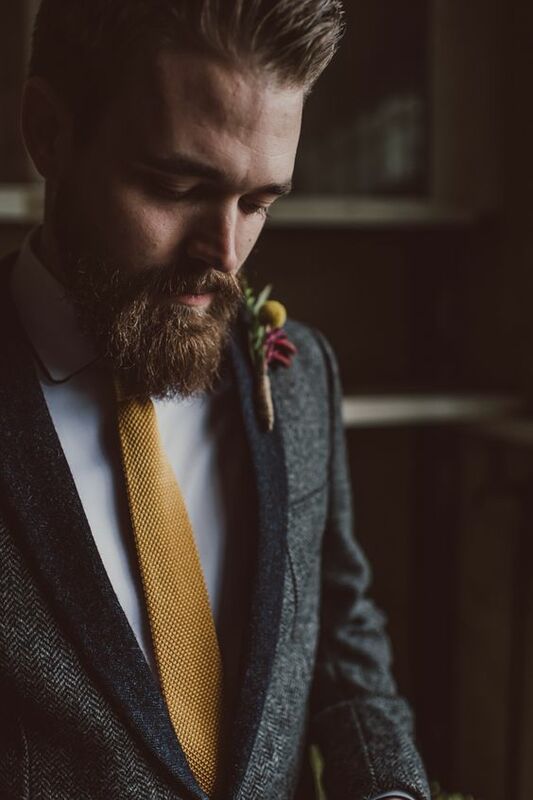 If you’ve chosen some mustard touches or a mustard wedding dress for your wedding, dress up your groom for a matching look – find a mustard jacket or a knit tie or a bow tie, so you will get a nice couple look. 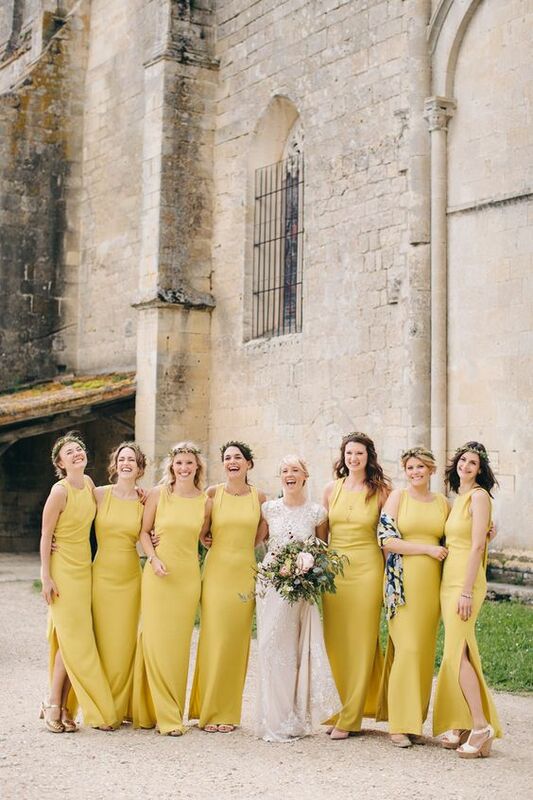 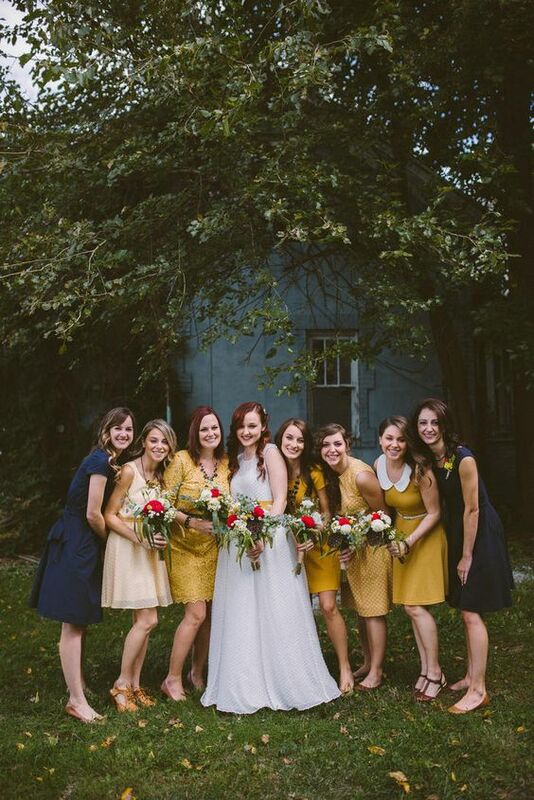 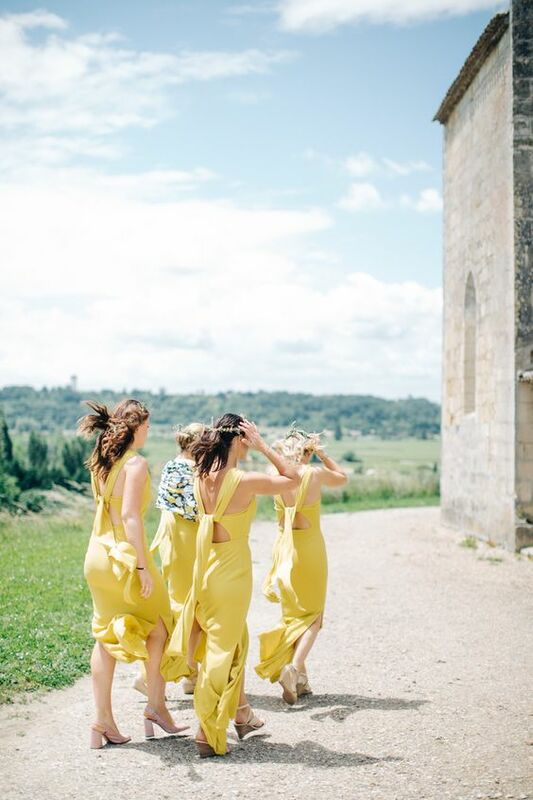 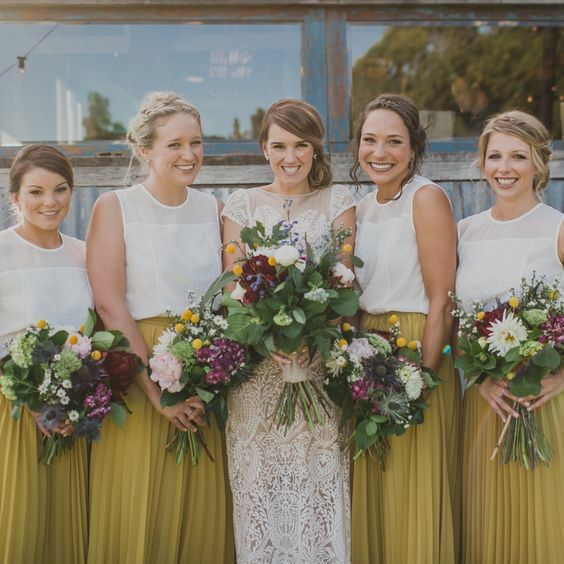 Your bridesmaids can wear mustard dresses: there’s a wide range of gown of different length, design and detailing, from short to long, from plain to lace, so you will find any dress for your wedding theme. 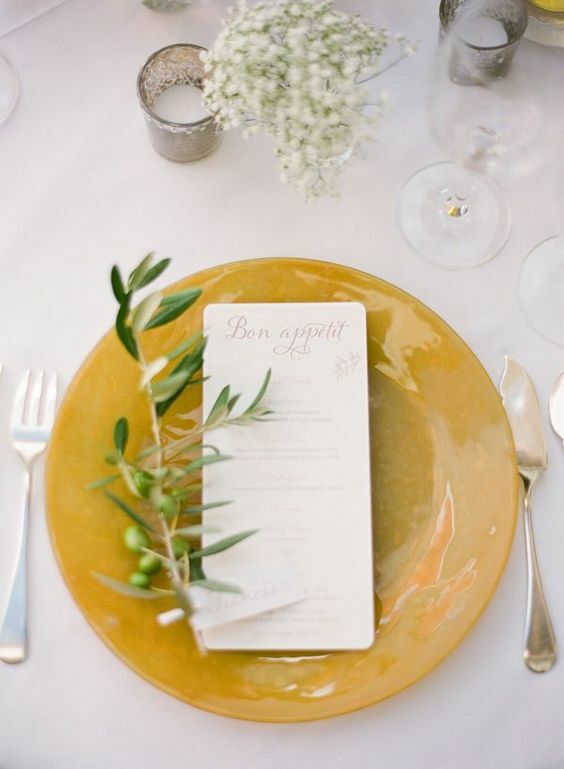 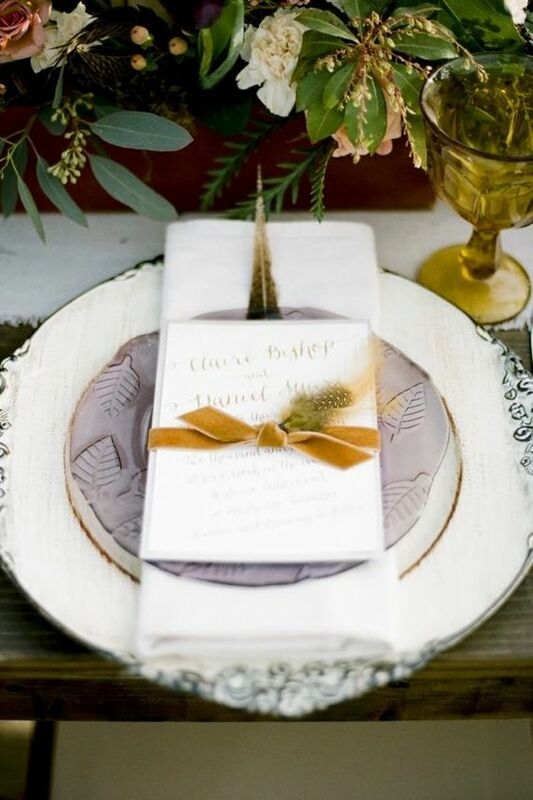 Add mustard touches to your wedding table décor: as the color is very bold, you don’t need much of it to get an elegant look. 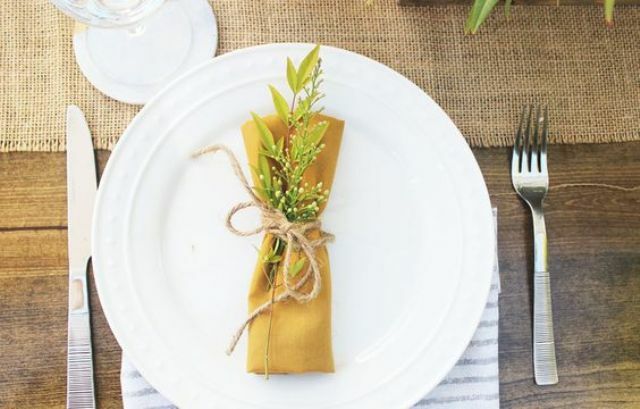 It may be a set of mustard napkins, a table runner, chargers, doilies, ribbons or napkin rings. 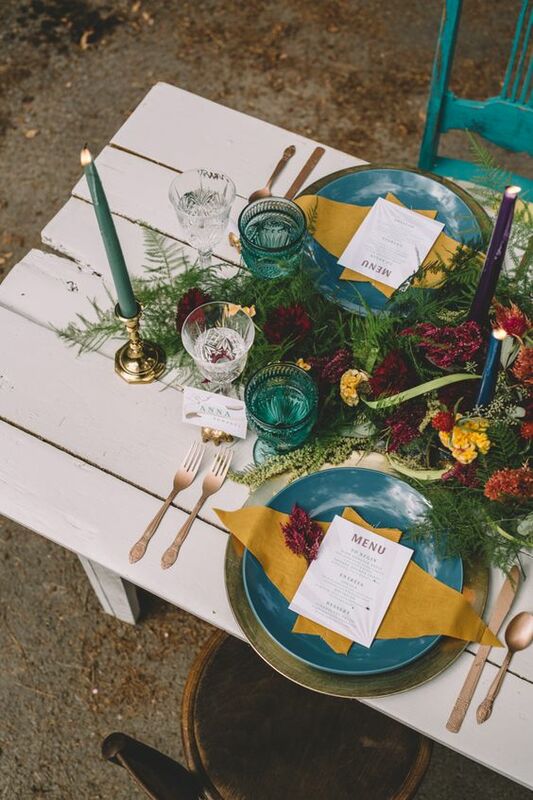 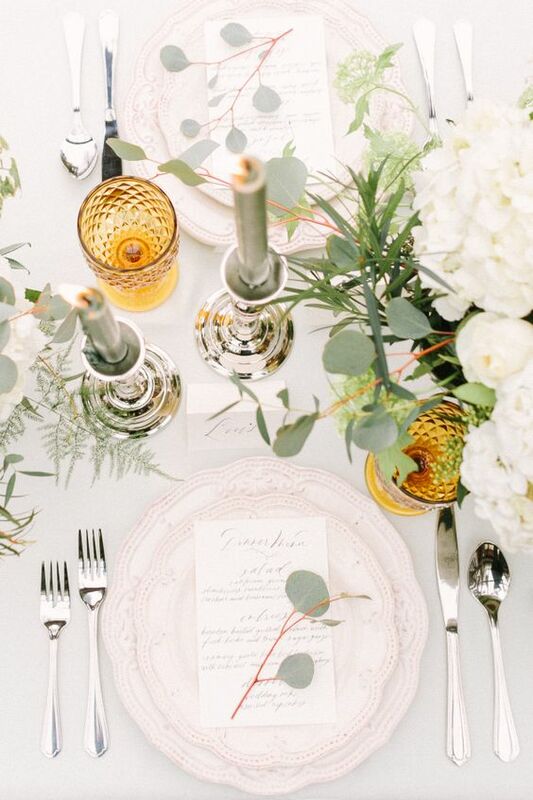 Mustard chargers, vases, plates or glasses are a simple idea to spruce your tablescapes with a truly fall color. 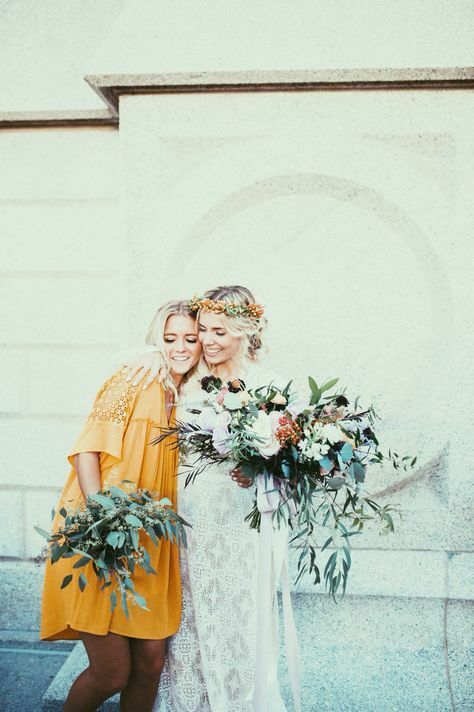 Mustard looks cool with neutral shades – cream, grey, white, with teal, various shades of blue and green, so you can easily incorporate mustard touches into different color schemes. 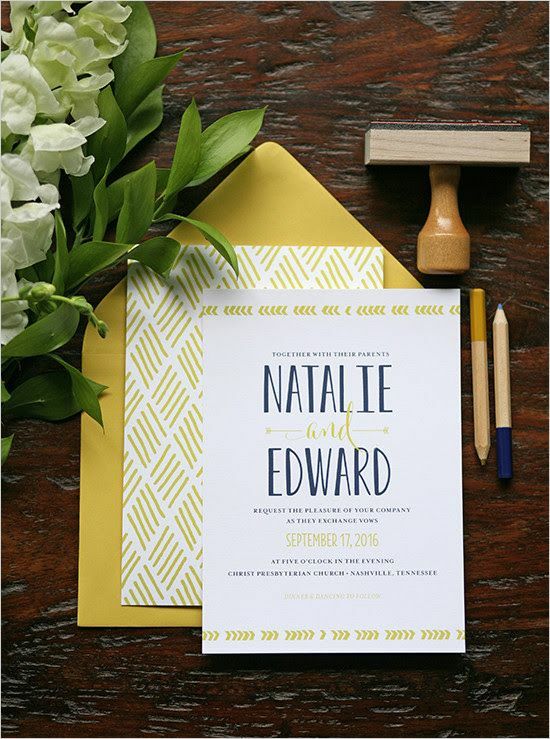 Some more ideas to add mustard touches to your wedding are mustard wedding invitations and envelopes. 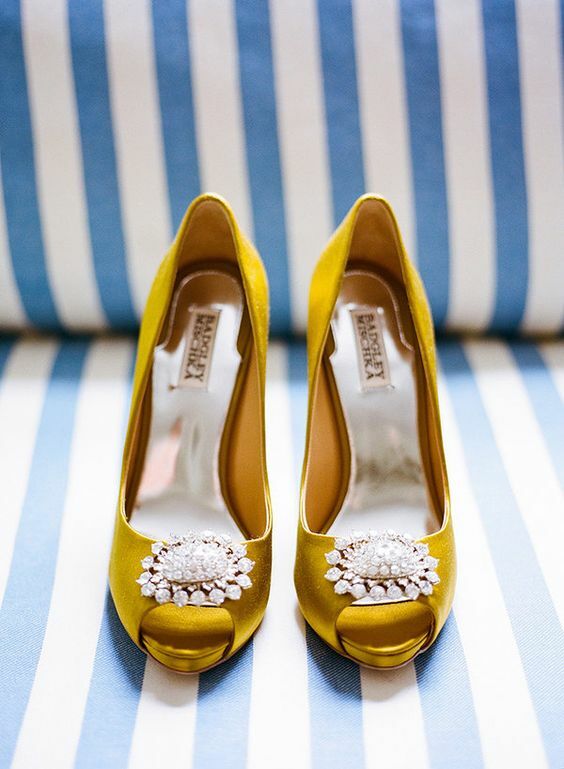 They will look refined with floral lining or elegant with navy or teal calligraphy or detailing. 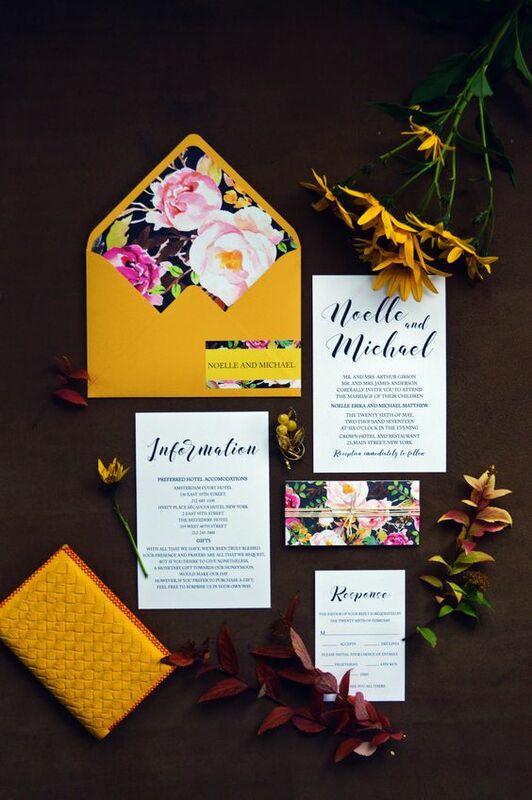 mustard faceted backdrops with lush florals and greenery look very modern and chic, plus they have a strong fall flavor. 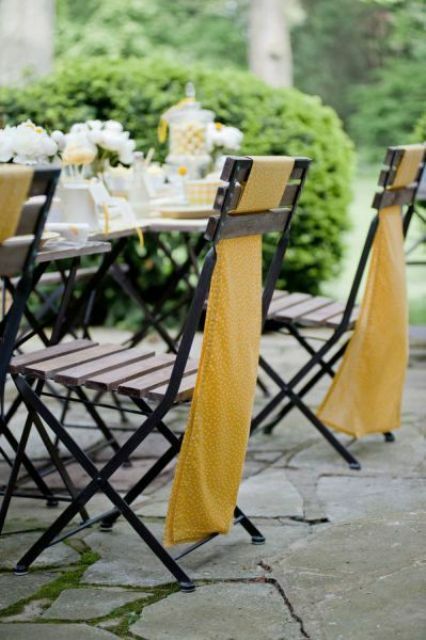 There are many more cool mustard ideas, so find your own ones and get inspired.